Help Fellow Groomers Affected by California Wildfires – Groom One for California! 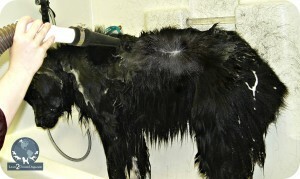 Our fellow pet groomers in California need our help! 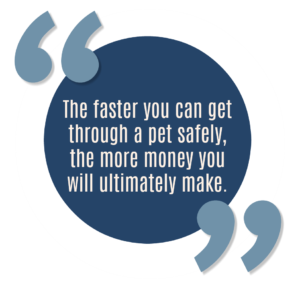 Join us and make a donation to the California Professional Pet Groomers Association (CPPGA). This organization will help fund those in need and distribute the funds that come from your generous donations. We have accepted the “Groom One for California” challenge of sending the proceeds from one grooming per day and we are asking you to do the same. Any amount helps! Finally, it was time to return to Michigan, but we had one more stop to make. As we made our way home, we stopped at new St. Louis office to visit our newest team member, Joe Zuccarello, and meet his family for the first time. The Atlanta Pet Fair was the kickoff for trade shows east of the Mississippi. To my husband Marc and myself, the Atlanta Pet Fair signals a month-long road trip in our motor coach. I love this trip. As we drive from the frigid north country, we see spring explode as we drive south. Instead of seeing a season slowly wake up, we see it in full bloom in a matter of hours. I get so excited as I see the first daffodils, the first red buds blooming, and the leaves just giving a hint of green. By the time we hit Atlanta, spring is upon us. It’ll only be a matter of time before our kayaks will be in the water and our bikes hit the trails. After the Atlanta Pet Fair, we schedule film shoots for Learn2GroomDogs.com. We enjoy filming Training Partners in their salons and many of live in the southern section of the United States. We’ve gotten very good at combining work and relaxing downtime for ourselves. Normally our schedule is very rigid, but this year we cut ourselves some slack. Between the Atlanta Pet Fair and our first film shoot, we had a little bit of unscheduled time. As we were just starting our trip, Delise of Bardel Bows contacted me. She and her husband Paul invited us to spend some time with them at their home, Pineola Farms. A few industry friends had shared with me how unique their home was. This southern plantation was established in 1865. In 1997 they bought the farm. Delise and Paul fell in love with the property’s rich history. They have taken it upon themselves to be the caretakers of this property while keeping the original family history firmly in place. We have been acquaintances with Paul and Delise Knight for years but never really gotten to know them. At trade shows I’ve always been impressed with the volume of beautiful bows they had at their booth. They always seemed to be busy. We left directly from the convention center after the Atlanta Pet Fair. The farm was less than two hours down the road. I knew their barn had been used for special events and weddings for the previous 10 years. However, Bardel Bows had grown so quickly in the past few years they opted to stop doing events. Recently, they moved the bow company into the barn. The barn was huge. It had a warm, friendly, and rustic elegance to it. The views from the lower level were amazing over the pecan orchard. Every bit of the space was functional. When I toured the work areas, I just smiled. It was more than just the gorgeous bows making me smile. It was their passion and attention to detail. Success comes from sweating the details. Paul and Delise make a great team when it comes to details. Their personalities complement each other perfectly. Here are a few of the items setting Bardel Bows apart. Bardel Bows have been designed by a groomer – for groomers. Delise owned a grooming salon in Georgia for years. Bardel Bows has been producing high quality, hand-tied dog bows for the pet grooming industry since 1989. All their bows are produced in Georgia by professional bow makers using the highest quality materials available. All their bows are handmade using long-lasting and sturdy latex bands. The unique design of Bardel Bows makes application a snap. Bardel Bows stocks hundreds of different grooming bows making up collections for every season. We were amazed at the level of professionalism and organization we saw at their headquarters. The VOLUME of bows and accessories – it blew my mind!! Every week Paul makes the rounds to their home based bow makers. He drops off supplies and picks up thousands of finished items. Delise gave me a tour of the upper level of the barn. I was so honored. Not everyone gets to see this area. It’s very private and the creative nerve center of Bardel Bows. I could have stayed there for DAYS letting my own creative juices flow! Delise and Paul have carved out a special niche in the grooming industry with their beautiful bows and accessories. However, their commitment to serve others goes way deeper than just running a successful bow business. We learned quickly that Paul and Delise live by this Mary Kay Ash quote. I think it’s a part of the warm southern culture. We saw and heard how they implement this thought every day in their lives, home, business, community, and how they interact with their employees and their customers. Here is just one tiny example. They gave out over 600 cupcakes at the Atlanta Pet Fair to venders and clients simply to introduce a new line of bows. The new line was introduced in the early spring of 2018 and called the Cupcake Collection. If you haven’t tried Bardel Bows to accessorize your grooms, I encourage you to give them a try. Their bows and accessories are fabulous. You can even find our older Maremma Sheepdog, Pearl modeling a large Fancy Spring Frill collar and a princess crown. Plus, I guarantee you’ll have a wonderful experience with their entire team! What are your favorite grooming products? Let’s talk about it on our Facebook page with your Melissa Verplank family.